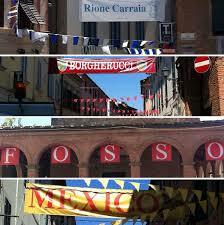 The most important festival in Peccioli are the “Rioni”, there are four “Rioni”, called Fosso, Messico, Borgherucci, and Carraia. They are held every Saturday of September. Each Saturday Peccioli chooses a theme for exemple this year the themes were the colors, the savannah, the military and the aliens. There is a typical dinner around the town’s streets. Dinner is without reservation and is self-service, with the fixed cost of 10 €. The food is typical of Tuscany. Bevarages such as water and wine are free. After dinner in the village square there are various types of music, such as commercial for the teenagers an and 70/80 music for the elderly.